Invite reads: With a great big hug and a kiss from me to you, Barney’s friend __ is turning two! I never thought I’d see the day that I would be so excited to see the Barney Live in Manila billboard posted somewhere near Eastwood. I had to stop and take note of the telephone number so that I could ask about the show. – For Inquiries and Ticket Reservations, call 709-0888. 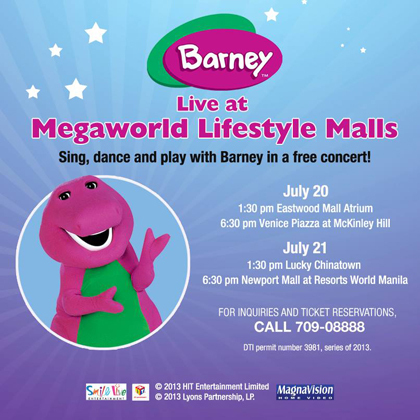 – For VIP Seats and exclusive Meet and Greet pass, you just need to buy P1,500 worth of Barney products at the Magnavision kiosk from July 11-21. One pass admits four but is valid only at place of purchase.